The Ubud Art Market, locally referred to as ‘Pasar Seni Ubud’ is located opposite the the Puri Saren Royal Ubud Palace and is open daily. Here you can find beautiful silk scarves, lightweight shirts, handmade woven bags, baskets or hats; statues, kites and many other hand-crafted goods. Most of the goods found at the Ubud Market are made in the neighbouring villages of Pengosekan, Tegallalang, Payangan and Peliatan. 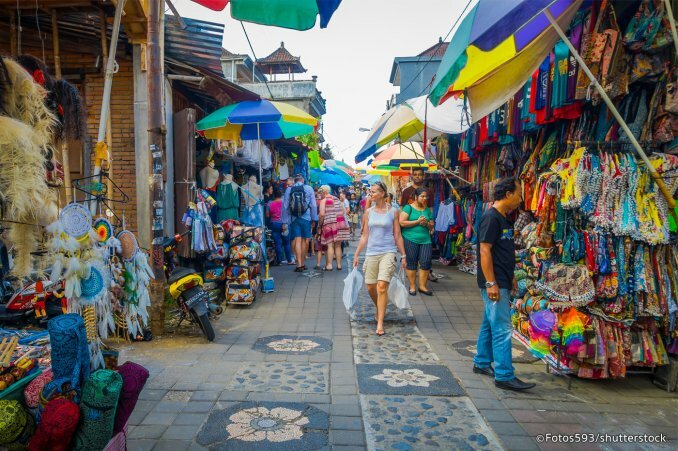 The location of the Ubud Art Market which is centred among the art producing villages, and being just opposite the royal palace which is a centre point to Ubud itself, make it a strategic shopping place for Balinese handicrafts and souvenirs.